The Syrian Republican Guard has repelled another ISIS offensive in Deir Ezzor. The fighting took place near the Deir Ezzor Airbase, the Tamin Brigade base and in the cemetery area. Earlier this month, ISIS allegedly transferred its self-proclaimed capital from Raqqah to Deir Ezzor amid the continued US-backed advance on Raqqah. If true, the terrorist group will increase attempts to capture the government-held area in the city. On April 25, Hayat Tahrir al-Sham (HTS) and its allies launched a counter-attack in northern Hama, aiming government forces in Masasanah and near Zilaqiat. In Masasanah, militants used a vehicle-borne improvised explosive device to break Syrian army defenses and entered the village. In Zilaqiat, HTS-led forces engaged government troops in a series of firefights. By April 26, government forces have re-entered Zilaqiat and repelled militant advance in Masasanah, according to pro-government sources. However, clashes are still ongoing in the area and will continue until HTS-led forces don’t burn their tactical reserves in the area once again. This is expected soon. On April 25, the Turkish Air Force bombed the Kurdish People’s Protection Units (YPG) General Command HQ in the Mount Karachok near the town of Al-Malikiyah, according to a statement released by the YPG General Command. Airstrikes also hit “a media center, a local radio station [Voice of Rojava FM], communication headquarters and some military institutions.” The YPG Central Command also confirmed causalities among YPG members and civilians. According to pro-Kurdish sources, about 20 persons were killed in the airstrikes. The YPG is a core of the US-backed Syrian Democratic Forces operating in Syria. 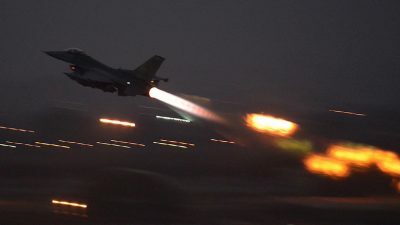 In turn, the Turkish military released a statement saying that Turkish warplanes had bombed members of the Kurdistan Workers’ Party (PKK) in northern Syria and in northern Iraq. Ankara sees the YPG as a branch of the PKK in Syria and describes it as a terrorist group. According to the statement, some 70 PKK members were killed in the air raids [30 – in Syria, 40 – in Iraq] and the targets were hit to prevent the PKK from sending “terrorists, arms, ammunition and explosives to Turkey.” The Turkish statement clearly dismissed speculations that Ankara forces hit US-backed fighters in Syria by mistake. In the same statement, Erdogan argued that Moscow is softening support for the Assad government referring to an alleged conversation with Russian President Vladimir Putin. Meanwhile, the Turkish artillery started shelling of YPG/SDF positions near Tell Rifat in northern Aleppo. Former Israeli Defense Minister Moshe Ya’alon has accidentally acknowledged that Israel has an open communications channel with the ISIS terrorist group, or at least its part operating in the Syrian Golan Heights. Speaking about Israel’s neutrality in the Syrian war on Satuday, Ya’alon said that the terrorist group apologized for opening fire on Israeli Defense Forces soldiers in the occupied Golan Heights. “There was one case recently where Daesh [ISIS] opened fire and apologized,” the Times of Israel quoted Ya’alon as saying. The statement was likely a reference to a clash that took place near the Syrian border last November, in which IDF troops exchanged fire with ISIS members.